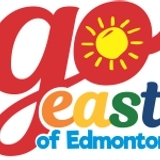 2018	Special	Events Celebration of Spring - Monday, May 21 Join the excitement of opening weekend with one of Alberta's largest Ukrainian dance extravaganzas. Vintage Day and the Friends Ukrainian Music Fest Sunday, June 24 - Drive back in time with a special display of historic vehicles on Vintage Day! New this year, Vintage Day will also feature the Friends Ukrainian Music Fest! Experience a live concert blending traditional and contemporary Ukrainian-Canadian music at the 33rd annual Music Fest presented by the Friends of the Ukrainian Village Society. 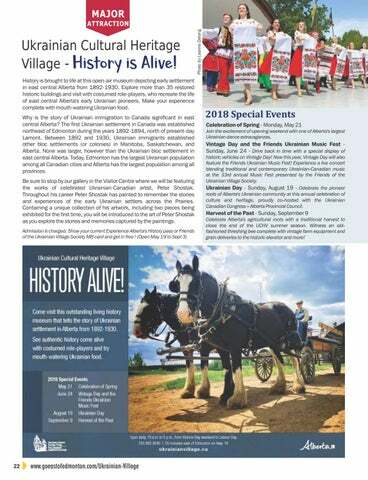 Ukrainian Day - Sunday, August 19 - Celebrate the pioneer roots of Alberta's Ukrainian community at this annual celebration of culture and heritage, proudly co-hosted with the Ukrainian Canadian Congress â&#x20AC;&#x201C; Alberta Provincial Council. Harvest of the Past - Sunday, September 9 Celebrate Alberta's agricultural roots with a traditional harvest to close the end of the UCHV summer season. Witness an oldfashioned threshing bee complete with vintage farm equipment and grain deliveries to the historic elevator and more!